The clear blue color of this aquamarine gemstone evokes the beauty of tropical, crystal-clear waters. But unlike the ocean, this ring won't suffer from cloudy days. 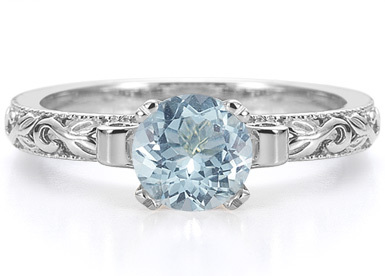 Instead, the art deco-inspired creation is always sunny with the round cut aquamarine gemstone that provides the perfect shine. The band of silver features a leaf-like pattern that is beautifully carved and carefully designed. Four prongs keep the aquamarine stone from slipping away and are supported by two swirls of silver on either side. We guarantee our Aquamarine 1 Carat Art Deco Ring Ring Sterling Silver to be high quality, authentic jewelry, as described above.